gig-fx will be at NAMM 2008 with its new Pro-Chop stereo tremolo and pan pedal. The Pro-Chop is similar to gig-fx pedal, the Chopper - a pedal that features an expression pedal to control the tremolo and pan rate - but with MIDI clock synchronisation and a back-lit screen. 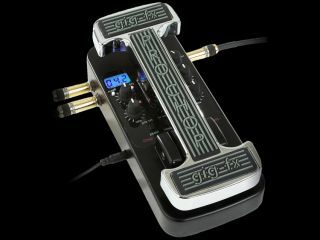 Not only will guitarists be able to use the expression pedal to adjust the rate as they play, but they will also receive visual feedback via the screen which will show either the tremolo/pan speed in Hz, or the exact tempo in bpm. Even more precise is the MIDI sync option, which will synchronise with any MIDI clock signal, setting the rate control accordingly. Like its predecessor, the ProChop has two oscillators: a square wave, for chop type effects; and a trangle wave, for tremolo and pan. These work independently of each other, and countless grooves and pulses can be generated by syncing the oscillators in different ways. Effects ranging from standard tremolo to emulations of delay and Leslie rotating speaker cabs can all be created. The pedal features a FET switch which gives pop-free circuit bypass, and is constructed from lightweight and durable aluminium. The ProChop has an RRP of $349. Visit gig-fx's website for more info, including sound samples.